Play for fun on the latest online slot Spin Town by Red Tiger Gaming to claim multiple Wild Symbols, Bonus Game Features and much more ! Visit the old England in this new slot game by Red Tiger Gaming named as ‘Spin Town’. This exuberant video slot is a 5 reels and 4 rows game with a total of 40 bet ways to win with. Located in the middle of the road, it holds the traffic still, making the Wilds (or residents of the town) wait, to cross the slot reels on the side walk. 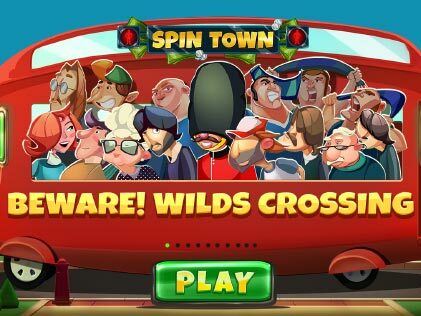 Holding no ‘Free Spins Feature’ in its clutches, this slot game has a town full of people or, in short, townies that act as Wild Symbols in the game. These people or these Wilds in the slot ranges from Old People to Youngsters to the Royal Guardsmen, along with Bonus Games Features that stars The Beatles Rock ‘N’ Roll Shuffle, the Kick Off Football Hooligans and much more, all over the reels of the slot game. A player can place the stake value from a £0.20 (or 20p) to a good £200 per spin, with the maximum jackpot win being 400x your stake (that totals to be around 80000) in winnings. It’s all fun and games in this video slot and it can be played on a regular basis without once getting bored. Read this unbiased review to know if you can play this game for real money or you can even try the free demo version, in order to gain more clarity. How to Play the Spin Town Video Slot ? Visit any of your favourite ‘Red Tiger Gaming Online Casinos’ and open the ‘Spin Town Slot Game’. Then, hit the ‘Play’ button, to either play for fun or to play for real money, once the main game opens. Once there, click on the ‘Spin’ icon to spin the slot reels at the current stake value. A player can change the stake value using the ‘+/-’ icons. The ‘Stake Value’ limit ranges from £0.20 to £200 per spin. Use the ‘AUTO’ icon to start the ‘Autoplay’ function of the game. A player can set the ‘AutoPlay’ action from a range of 10 spins to a maximum of 100 automatic spins. Use ‘Turbo’ to spin the reels at a faster pace. This online slots game features ‘Multiple Wilds’, that can further combine to activate Wild Features in the game, along with 3 Bonus Games Features that makes the game super interesting. 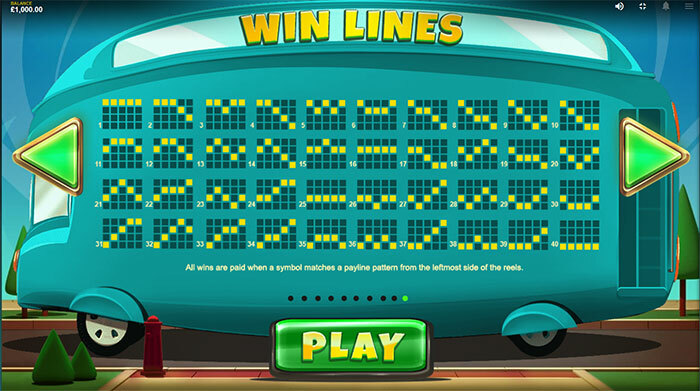 All the wins lines are paid when a symbol matches a pay/ bet line from the leftmost side of the reels to the rightmost side. Any type of progress features in the slot game (this includes any symbols that might be locked on the game reels), which can directly affect the ensuing spins, will be saved for the game at that particular stake level i.e. the level that is being played at the given moment. This indirectly means that a player can choose to have multiple or different progress levels at each stake. Furthermore, a player can move between different progress levels by changing the stake level. The ‘Total Stake’ refers to the total of stakes per line in the game. A player can set its value using the ‘+’ or ‘-’ button. In case of more than one win on a payline, the largest or maximum win is paid out to the player. In order to calculate the prize win from a single payline or betline, a player can divide the total stake by the number of paylines, which will be further multiplied by the particular symbol multiplier as per shown in the payout table. Here, in case of multiple wins on more than one win line, the value of the total wins will be cumulative. The RTP of the game is calculated to be 96.23% approximately. The maximum multiplier in this slots game is calculated to be 400. Spin Town Slot Game has a total of 40 pay/ bet lines. This slot game is set in the old town of England (which can also be termed as Blighty or simply Britain to some). The base game shows the scene of a busy road with a red light traffic man on the top of the reels. There are pedestrians acting as Wild Symbols on the corner of the road, on both sides, waiting for the light to turn green i.e. for the green man to appear. Once it does, any of the 15 Wild characters can start the short walk towards the other side of the reel, doling out wins and payouts as well as triggering bonus game features along on the way. The visuals are high- spirited, silly and fun in all its glory, with the background sounds giving the impression of a busy day in the life of the people living in Spin Town. Stake or Bet Value : The minimum ‘Stake’ or ‘Bet Value’ a player can wager in this slot game is £0.20, with the maximum stake being £200.00 per spin. Turbo :A player can use the ‘TURBO’ button on the right hand side of the slot game in order to spin the reels of the game at a more faster rate. Spin :The ‘Spin’ icon is depicted by a Yellow button on the utmost right hand side of the reel. It has two brown colored rotating arrows on it. A player can click on it to spin the reels at the current bet value or stake. Auto Play :The ‘AutoPlay’ button is depicted by the ‘AUTO’ icon on the left hand side of the slot reel. A player can easily set the limit from 10 spins to a maximum of 100 spins. A player can also set the ‘Loss Limit’ here, in order to stop the reels.Moreover, by clicking on ‘More AUTOPLAY Settings’, a player can choose to select the ‘Win Limit’ at which the Auto Play action can be stopped, if exceeded. A player can stop the reels when a ‘Bonus Feature’ is encountered as well. Wild Symbols: The ‘Wild Symbol’ is enacted or represented by the various residents of Spin Town. There are a total of 15 Wild Symbols in this video slots game. These Wilds can substitute for all paying symbols in the game. They are also responsible for the highest payout of the game, which is a whooping 400x your stake. High Payout Symbols: There are 5 High Payout Symbols namely - The Money Bags Suitcase, The Motor Cycle Helmet, The Ghetto Stereo, The Wallet and A Key. Among these, the Money Bags Suitcase being the highest payout symbol with a pay rate of 300x your stake, when appeared 5 times on a payline. Low Payout Symbols: There are a total of 4 Low Payout Symbols in this video slots game. They are the playing suit cards, namely : A, K, Q, J and a 10. Spin Town is yet another great slot by the software provider - ‘Red Tiger Gaming’, which is a multi- award winning casino supplier for a while now. The main agenda of the software team at Red Tiger is to find innovative and exciting ways to balance the artwork and science of the casino game designs, which is a theory completely justified by the magnificence and Fun- tastical design of Spin Town. Some of the other popular games by Red Tiger Gaming includes Slots like Lucky Mr. Green, Mystery Reels, Mystery Reels Megaways, Red Diamond, Reel Heist, Lucky Valentine, Crazy Genie, Lucky Wizard, Fortune House, Puss ‘N Boots, Jack In A Pot and much more. All these games can be operated on multiple platforms, may it be your Smart Phone (or Mobile), a Desktop (or PC), a Laptop or a Tablet. This software manufacturer uses the HTML5 technology and supports a multilingual system, thus making its casino games accessible to players all around the world. Sleepy Wilds Feature : These are indicated by an old man and woman that might fall asleep during their walk (i.e. they tend to loosely act as Sticky Wilds), leading them to stay on the slot reel for long periods of time or game rounds. Speedy Wilds Feature : These Speedy Wild Types are faster and younger and might move 2 steps at a time on each spin. They are amped up to go places ! Couple Wilds Feature : This is represented by two Couple Wilds, whom, if they met on the reel, tend to combine to turn in to a Wild Umbrella, thus sticking on the reels as Wilds, with a 2x multiplier when captured on a winning combination. Moreover, only one Couple Wild can be activated per line. If a game player manages to land 3 ‘Rock ‘N’ Roll Symbols’ ( i.e. The Beatles Rock ‘N’ Roll) on the slot reels, then the ‘Rock ‘N’ Roll Shuffle Feature’ will activate four ‘Rockin' Wilds’ that can cross the slot up to a total of 10 times. In the ‘Guardsmen’s March Feature’, the landing of 3 ‘Guardsmen Symbols’ (i.e. the Royal Guards are on the duty here) on the reel will activate the ‘1x2 Mega Wilds’. 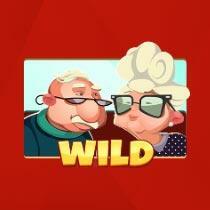 These Wilds can cross the reels of the slot game from both sides. For the ‘Hooligan Advance Feature’, a player has to land 3 ‘Kick Off Symbols’ (in short, it’s time to enjoy the Football Hooligans), which will in turn trigger the occurrence of the ‘Hooligan Wilds’ on the reels. These Wilds are allowed to cross the slot reels from either side. Also, they tend to move as closely packed groups. If you are looking for a fun slot that gives out multiple wins in a short amount of time, then this is definitely the right slot for you. Spin Town is a 5 reels and 4 rows video slot game with a low variance and a RTP of 96.23%. It is designed by the software manufacturer Red Tiger Gaming and has a total of 40 bet lines for you to win with. This game takes you to the middle of the road, in an old town of England, with pedestrians waiting on the side walk for the traffic man to turn green. Despite not having a Free Spins Feature, it makes up for it big time by using multiple Wilds, that can further trigger no more than 3 Wild Features in the game. There are other Bonus Game Features in this game as well. The game is extremely fun to play for those who get bored easily and like to win continuously. The maximum pay out will be 400x your total stake, with the possibility of many small wins on your path. The features and graphics of the game are high quality and very lively. There is not a single moment in this ‘Spin Town’ slot game that is dull or uninteresting. Please enter your review for the Spin Town Slot.